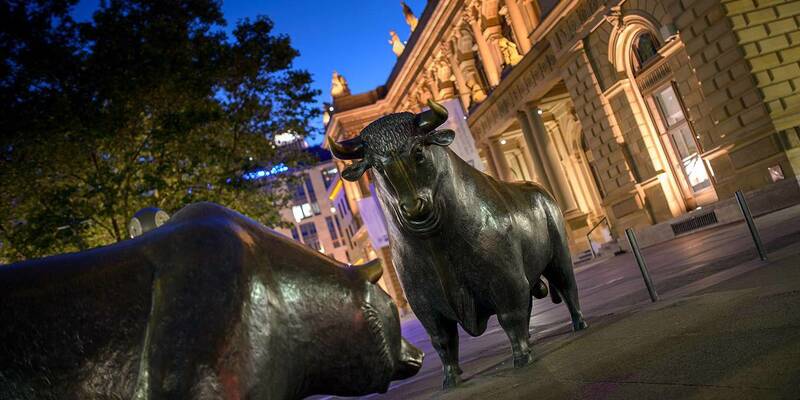 After the global risk-off of late 2018, a newfound dovishness on the part of central bankers has combined with other positive developments to revive investors' animal spirits. But with a wide array of financial and political risks clearly in view, one should not assume that the current ebullience will last the year. NEW YORK – Financial markets tend to undergo manic-depressive cycles, and this has been especially true in recent years. During risk-ons, investors – driven by “animal spirits” – produce bull markets, frothiness, and sometimes outright bubbles; eventually, however, they overreact to some negative shock by becoming too pessimistic, shedding risk, and forcing a correction or bear market. Whereas prices of US and global equities rose sharply throughout 2017, markets began to wobble in 2018, and became fully depressed in the last quarter of the year. This risk-off reflected concerns about a global recession, Sino-American trade tensions, and the Federal Reserve’s signals that it would continue to raise interest rates and pursue quantitative tightening. But since this past January, markets have rallied, so much so that some senior asset managers now foresee a market “melt-up” (the opposite of a meltdown), with equities continuing to rise sharply above their current elevated levels. One could argue that this latest risk-on cycle will continue for the rest of the year. For starters, growth is stabilizing in China, owing to another round of macroeconomic stimulus there, easing fears of a hard landing. And the United States and China may soon reach a deal to prevent the ongoing trade war from escalating further. 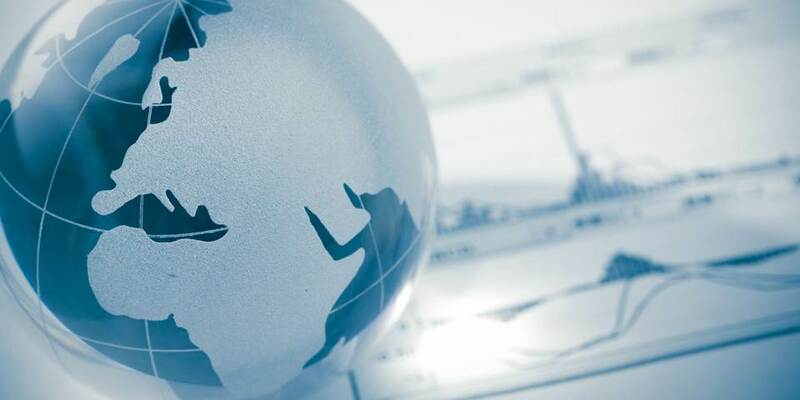 At the same time, US and global growth are expected to strengthen somewhat in the second half of the year, and the disruption of a “hard Brexit” has been averted, with the European Union extending the deadline for the United Kingdom’s departure to October 31, 2019. As for the eurozone’s prospects, much will depend on Germany, where growth could rebound as global headwinds fade. Moreover, central banks, particularly the Fed, have become super-dovish again, and this appears to have reversed the tightening of financial conditions that produced the risk-off in late 2018. And on the political front, the chances of impeachment proceedings in the US have fallen sharply with the release of the Mueller report, which clears US President Donald Trump of criminal conspiracy charges (though it is not dispositive on the question of obstruction of justice). Now that the Russia investigation is over, Trump may avoid issuing destabilizing statements (or tweets) that could rattle the stock market, given that it is a key benchmark by which he judges his own success. Finally, in a positive feedback loop, stronger markets boost economic growth, which in turn can lead to even higher market values. These developments may or may not ensure clear sailing for the rest of the year. While markets have already priced in the aforementioned positive potentialities, other factors could trigger another risk-off episode. First, the price-to-earnings ratio is high in many markets, particularly for US equities, which means that even a modest negative shock could trigger a correction. In fact, US corporate profit margins are so high that there could be an “earnings recession” this year if growth remains around 2%, while production costs may increase with a tight labor market. Second, there are heightened risks associated with the scale and composition of US corporate-sector debt, owing to the prevalence of leveraged loans, high-yield junk bonds, and “fallen-angel” firms whose bonds have been downgraded from investment-grade to near-junk status. Moreover, the commercial real-estate sector is burdened with overcapacity, as developers overbuilt and e-commerce sales have undercut demand for brick-and-mortar retail space. Against this backdrop, any sign of a growth slowdown could lead to a sudden increase in the cost of capital for highly leveraged firms, not just in the US, but also in emerging markets, where a significant share of debt is denominated in dollars. Third, assuming that US economic growth holds up, market expectations of more Fed dovishness will likely prove unfounded. Thus, a Fed decision not to cut rates could come as a surprise, triggering an equity correction. Fourth, hopes of a resolution to the Sino-American trade war may also be misplaced. Even with a deal, the conflict could escalate again if either side suspects the other of not holding up its end. And other simmering trade tensions could boil over, if, for example, the US Congress fails to ratify the Trump administration’s revised North American Free Trade Agreement, or if Trump follows through with import tariffs on cars from Europe. Fifth, European growth is very fragile, and could be hindered by any of a number of developments, from a strong showing by populist parties in the upcoming European Parliament elections to a political or economic crisis in Italy. This would come at a time when monetary and fiscal stimulus in the eurozone is constrained and eurozone integration is stalled. Sixth, many emerging-market economies are also heavily exposed to political and policy risks. These include (from least to most fragile): Mexico, Brazil, Argentina, Turkey, Iran, and Venezuela. And China’s latest round of stimulus has saddled its already indebted corporate sector with even more financial risk – and may not even suffice in lifting its growth rate. Seventh, Trump may react to the Mueller report with bluster, not prudence. With an eye to the 2020 presidential election, he could double down on his fights with the Democrats, launch new salvos in the trade war, stack the Fed Board with unqualified cronies, bully the Fed to cut rates, or precipitate another government shutdown over the debt ceiling or immigration policy. At the same time, the Trump administration’s approach to Iran and Venezuela could put further upward pressure on oil prices – which have rallied since last fall – to the detriment of growth. Finally, we are still in a world of low potential growth – a “New Mediocre” sustained by high private and public debt, rising inequality, and heightened geopolitical risk. The widespread populist backlash against globalization, trade, migration, and technology will all but certainly have an eventual negative impact on growth and markets. So, while investors’ latest love affair with equity markets may continue this year, it will remain a fickle and volatile relationship. Any number of disappointments could trigger another risk-off and, possibly, a sharp market correction. The question is not whether it will happen, but when. Alphaville used to spend a lot of time listening to people in markets talk about the Dallas Fed's trimmed mean PCE and the Cleveland Fed's median CPI. These are alternate ways to measure inflation. Both are completely legitimate and interesting in their own way, but in early 2015 they also happened to show a higher inflation rate than the Federal Open Market Committee's benchmark measure, core PCE. A generous interpretation of these conversations would conclude that people were really, really interested in finding the best way to measure inflation. It's also possible, however, that they were just shopping for inflation. We thought about this as we read an argument from Stephen Moore, Trump's new nominee for the Fed, that the FOMC should be watching changes in the price of oil and wheat and aluminum. "The Fed’s goal should be to avoid excessively loose or tight money by seeking stable commodity prices," he wrote in an oped for the Wall Street Journal. This would be a radical shift, one no one at the Fed has talked about in decades. But: Commodity prices have dropped sharply since October, and by some measures are now technically deflating. Central banks respond to deflation first with panic, then with dramatically accomodative monetary policy. So again here, a generous interpretation is that Mr Moore is really, really interested in finding the best way to measure inflation. It's also possible, however, that he's just shopping for a way to say the word "deflation." "No serious monetary economist thinks it's a good idea to target commodity prices," says Mark Gertler. Commodity prices can provide some information, he says, and the Fed certainly takes them into account, but they're not a great signal of future inflation. Mr Gertler, a macroeconomist at NYU who's advised the New York Fed, says there was a time when economists considered using commodity prices as a benchmark for monetary policy, but that time was several decades ago, and they abandoned the idea. "The problem," says Gertler, "is commodity prices are determined in these highly competitive markets that are subject to all sorts of shocks." Some prices are "sticky" -- it's hard to get them to change. Ice cream prices, for example: very sticky. Commodity prices are the least sticky of all. Wheat and crude and aluminum and natural gas are sold by sophisticated traders in large volumes on global markets. And because those markets are global, shocks anywhere in the world can shift prices: droughts, coups, embargos, cartels, tariffs. It's... volatile. And becoming more so. Aluminum is solid power, by the way... it takes 15 megawatt hours to create one ton of aluminum, plus a couple tons of alumina. It's hugely energy intensive. And so what you're actually looking at up there is a history of shocks to global petroleum prices. Demand rose from China in the early 2000s, with an immediate recovery after the recession. Prices collapsed after the innovations of fracking, followed by a price war with Saudi Arabia, and even more efficiency from US frackers. Commodity price indexes swing on a bunch of stuff the Fed can't control, and they swing too quickly for the Fed to react. Mr Blanch points out that commodities are becoming a smaller part of the consumer "basket" -- what people buy. With fracking, there's more certainty of a return every time a company drills a hole, so the price of oil no longer shows the risk of a dry hole. Over time, he said, this has been dragging crude prices down, and will drag it lower in the future. That's all on the supply side of energy. There will be changes to the demand side as well. "We are transitioning to a very different economy in the next ten years," says Mr Blanch. "And we're going to see a meaningful increase in fuel efficiency rates in the next five years." So: energy and in particular oil are a huge part of any commodities index. They are incredibly volatile now, and will be a smaller part of any consumer basket in the future. "Most economists agree, what you want to target is not just a fraction of the basket of commodities," says Mr Gertler. "You want to target a suitably weighted average of all of the goods and services, not just the component that's most volatile, that's nuts." Again, Mr Moore could be really interested in how best to measure inflation. Plenty of people are. The Cleveland Fed is holding a whole conference on the subject in May. Perhaps Mr Moore is worried in particular about supporting commodity prices for oil-producing states like Texas, or soyabean-producing states like Iowa. Or perhaps he's just shopping for deflation. Alphaville called Mr Moore last night and this morning. We'll update the post if we hear back. Beijing is taking another stab at regulating the financial sector. Beijing is hurtling from one economic reform attempt to the next, but it’s creating ever more problems in its wake. At the plenary meeting of China’s rubber-stamp legislature, Beijing rolled out yet another slate of adjustments to its economic reforms. The steps taken at the National People’s Congress are the latest in China’s ambitious plans to micromanage its way through its slowdown without sparking a financial crisis. This round is aimed primarily at the private sector, which is suffering from a major credit crunch. The quick fix: some 2 trillion yuan (nearly $300 billion) worth of cuts to corporate taxes, fees and pension contributions – which combined are worth as much as 2 percent of China’s gross domestic product – plus pledges to get lending to those who need it. The reality is that the problems Beijing is trying to address now are the direct result of prior attempts to fix other problems. The current credit crunch was spawned by a crackdown on shadow banking. Shadow lending proliferated because of Beijing’s attempts to stave off inflation. The risk of inflation arose only after Beijing opened the stimulus floodgates during the 2008 global financial crisis. Beijing is evidently desperate to find calmer waters, so it’s also rolling out major plans for “financial supply-side structural reform.” Details are vague at this point, but it heralds Beijing’s most ambitious attempt to stabilize the Chinese financial system. It’s worth a shot. But the sector’s appetite for risk is perpetuated by slowing growth and the Communist Party’s intolerance for a socio-economic crisis; Beijing won’t find much smoother sailing from here. Trade-offs and unintended consequences are inherent in any major reform push. Beijing, facing a staggering number of social and economic challenges, is pushing reform across the board. But it seems that each time it tries to put out one fire, it starts another – illustrated most vividly in the Chinese banking sector. Throughout the 1990s and early 2000s, China’s unusually high household savings rates gave banks a stable deposit base, and breakneck growth among state-owned enterprises and property developers made it easy for Chinese banks to paper over inefficiencies. The state-centric financial system was rigid and unresponsive but relatively stable. But when the 2008 global financial crisis struck, exports and profitability plummeted, throwing the entire Chinese economy, including the financial sector, into turmoil. In response, Beijing took decisive action to spur lending and unleashed a fire hose of fiscal stimulus packages worth nearly $600 billion. Most important, Beijing lifted effectively all constraints on spending by and lending to local governments, and over the next two years, the economy was flooded with some $2.8 trillion in new lending. Within three years, the value of assets held by the Chinese banking system had soared by 77 percent. These measures managed to contain the immediate crisis; official GDP growth rebounded to 10.6 percent within two years. But they caused other problems. The economy had become overdependent on cheap credit, and local governments maneuvered to make it nearly impossible for anyone to turn off the spigot. By 2011, Beijing began to fear inflation. In response, the People’s Bank of China took measures like raising interest rates and forcing banks to hold greater capital reserves to curb lending. 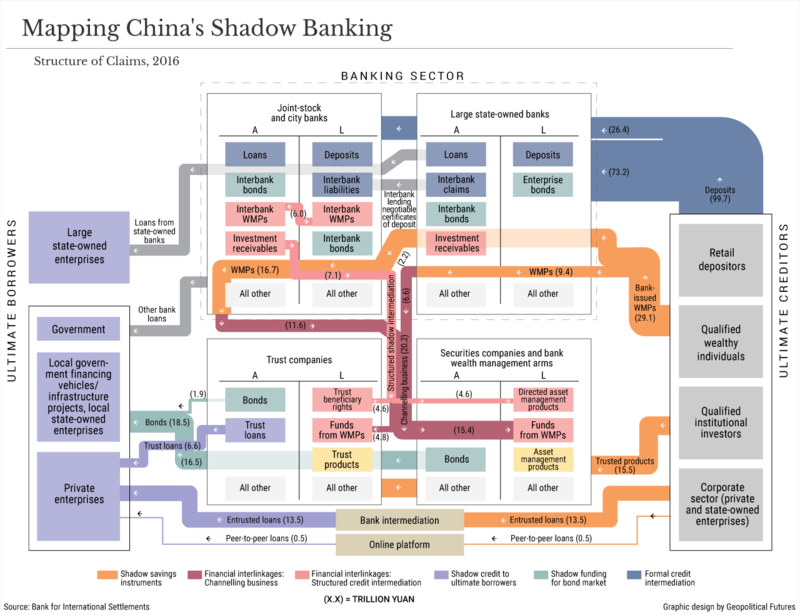 The central bank’s moves allayed inflation concerns, but they caused an array of new problems – most consequentially, the dramatic rise of “shadow banking.” In China, companies rely on bank lending to an unusually high degree; just 18 percent of total financing in the country last year came from channels like equity and bond sales, according to Caixin. Stricter monetary policies meant less bank capital to go around. And with state-owned enterprises (whose debts were implicitly guaranteed by the government) and property developers (who could offer greater collateral than most private firms) eating up the overwhelming share of bank lending, private firms were increasingly forced to seek more expensive loans through informal channels or overseas banks, exposing them to costly currency fluctuations. Banks, under pressures of their own, also retreated into the shadows. Beginning in late 2011, the financial crisis in Europe had reduced flows of foreign currency to Chinese banks to a trickle and, by weakening the yuan, raised borrowing costs. Banks faced a drop in available funding, but Beijing demanded that they keep doling out credit to often deadbeat local governments – somehow without violating strict capital requirements. To reconcile these conflicting pressures, banks embraced increasingly risky financial instruments, including convoluted interbank lending schemes and off-balance sheet vehicles such as wealth management products, or WMPs. And they got very good at hiding them – and the nonperforming loans they often carried – from regulators. As competition for depositors and investors intensified, banks had to offer ever higher rates on their WMPs or take on ever riskier assets. Their margins shrunk, increasing the risk of cascading defaults. But since Beijing had always backstopped the financial sector, and since the Communist Party couldn’t stomach the political fallout of a cleansing financial crisis, the banks assumed the state had implicitly guaranteed unregulated assets as well. The shadow lending raged on. Beijing had created a moral hazard epidemic. But after a technical default between two small banks sent interbank lending rates soaring in early June 2013, Beijing refused to inject liquidity into the market, attempting to smash its implicit guarantee. This caused an almost cataclysmic new problem. Within days, interbank lending ground to a halt, sparking a liquidity crisis that began to spread into the rest of the economy. Beijing capitulated by the end of the month, intervening more forcefully to keep interbank lending rates stable. Markets stabilized for the next two years, but the measures exacerbated other problems. By capitulating, Beijing erased any doubts about its implicit guarantee of off-balance sheet assets. And by reducing volatility in money markets, it only increased incentives for yield-seeking banks to further expand the shadow banking bonanza. By 2016, according to the rating agency Fitch, total shadow banking assets had surpassed 70 percent of GDP. Beijing’s attempts to crack down with new regulations mostly just pushed banking activities further into the shadows. Finally, in 2016, President Xi Jinping declared financial risk a priority on par with national security, and Beijing moved more decisively to bring the party to a close. Greater short-term volatility was allowed in money markets, making speculative lending less lucrative. China’s outdated regulatory apparatus was overhauled to close loopholes and eliminate arbitrage. Stringent new rules were announced, and Xi’s feared anti-graft drive was expanded to ensure compliance. By most metrics, Xi’s measures appear to have worked, at least in terms of pushing lending back onto balance sheets. In 2018, according to Moody’s, the shadow banking sector, which had peaked at 87 percent of GDP, contracted for the first time in a decade, dropping back below 70 percent. Outstanding loans in the sector dropped 6.5 percent. New loans in the formal banking sector, meanwhile, increased 13 percent year on year. Yet, once again, the reforms have spawned new issues – ones that can’t be fixed painlessly. 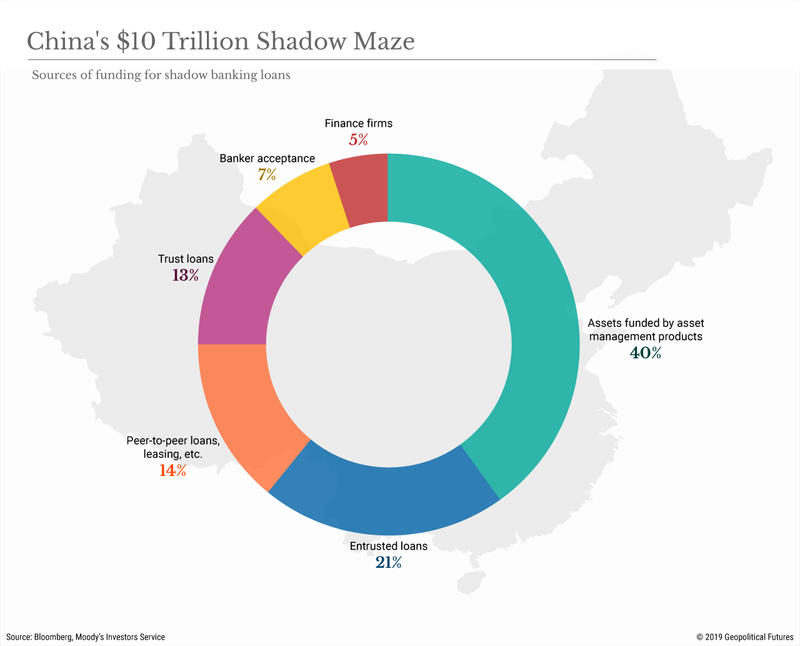 For all the risks it spawned, shadow lending has helped keep credit flowing to areas where formal lending channels were falling short; the American Economic Association estimates that 80 percent of private firms in China have relied on shadow banking at some point. Without it, China is once again grappling with a credit crunch. Total social financing, a broad measure of credit and liquidity, contracted for most of 2018, until Beijing started boosting monetary stimulus toward the end of the year. According to Financial Times data, Chinese banks will need to raise some $260 billion in fresh capital over the next three years as they start to put informal loans on their balance sheets. Private firms, in particular, have been hit hard, accounting for 16 billion yuan of the 20 billion yuan in onshore bond defaults in China last year, according to Natixis. The private sector now accounts for more than 60 percent of GDP, and it’s creating 90 percent of new jobs in China. But firms in the all-important coastal provinces are the most vulnerable to the trade war with the U.S. The problem is that newly risk-averse Chinese banks are simply ill-suited and poorly incentivized to meet the sector’s needs. It’s easier, less risky and often politically advantageous to prioritize state-owned enterprises – which banks can be sure won’t be allowed to collapse – rather than gearing up to make prudent assessments of scads of private firms in dubious financial standing. Beijing has to find a way out of the credit crunch, but it’s trying to avoid another overcorrection. The measures announced at the NPC, particularly the tax cuts, are a relatively low-risk way to keep money in private sector accounts. Beijing also continues to pledge that it’s not about to flood the economy with stimulus on the scale of 2008. Senior regulators, meanwhile, are hinting they might be willing to allow the return of some “good shadow banking activities” – that is, anything that prudently channels money into the real economy. Whether they can really monitor activities that were designed to be hidden closely enough to distinguish between good and bad off-book lending (when even banks have struggled to do so) is another question. Regardless, some fallout from these measures is inevitable, particularly as growth slows. At minimum, forcing banks to lend more to private firms will undermine the government’s parallel goal of limiting overall credit growth. More important, the underlying structural and political problems locking Beijing in this high-stakes game of financial whack-a-mole haven’t gone away. The new emphasis on financial supply-side structural reform suggests that Beijing may be gearing up for major surgery. The government today is certainly better equipped than previous administrations to spur reform among the entrenched interests opposed to painful restructuring. But at this point, the proposed reforms are more an acknowledgment of China’s problems than a detailed plan for fixing them. Meanwhile, Xi has only deepened the role of state-owned firms in the economy and party influence over private firms. Similarly, keeping firms reliant on banks for financing rather than channels like investors and stock markets is another lever of the party’s power. When the choice is economic efficiency or control, Xi chooses control; state dominance of the economy is indispensable. There’s nothing to suggest China has any real intent or ability to build a liberalized, dynamic formal financial sector capable of meeting a dizzying mix of oft-conflicting political and economic aims. To address moral hazard, meanwhile, Beijing has been desperately trying to persuade banks and investors that off-balance sheet instruments like WMPs are not government guaranteed, and the government refused to intervene during a spike in peer-to-peer defaults last year or amid the recent surge of private sector bond defaults. But neither of these posed systemic risks. What’s clear to the financial sector is Beijing cannot stomach the collapse in growth that would come with a widespread credit crunch. Neither can it stomach the political fallout of a cleansing financial crisis. Beijing can yell about prudence and moral hazard until it’s blue in the face; it’ll still be stuck searching for a way to let the economy drive itself – without letting it drive over the precipice. Corporate concentration has been growing in the US. According to the McKinsey Global Institute, profits and losses among both US and European companies are more concentrated than two decades ago. So why are calls for “national champions”— large companies protected and supported by the state — growing too? European policymakers want to create Franco-German giants that could rival those in the US or China. The German government may use its stake in Commerzbank to orchestrate a merger with Deutsche Bank, creating a state-backed behemoth. In the US, Big Tech has promoted the idea that breaking up companies like Facebook or Google could mean losing the tech race with China. US government officials are urging the oil industry to support American foreign policy goals and threaten countries including Germany and the UK with losing US intelligence information if they do business with China’s Huawei. The rise of China, with its model of state-supported capitalism, is the obvious trigger. Although Beijing is now playing down its Made in China 2025 campaign, which stoked economic nationalism in the US and Europe, the basic strategy of favouring local players hasn’t changed. The US-China trade war may further Balkanise markets, as Europeans and developing countries are forced to decide whose 5G networks, chips and digital technologies they want to use. Some of this is justified, given the different national philosophies around data protection and what is called surveillance capitalism. But even before all the concerns about digital competition, state support for individual industries was growing. In the aftermath of the financial crisis, both the US and Europe bailed out banks and automakers. Even after the crisis eased, there was a lasting sense that more government planning was necessary. From France to Japan, governments tried to deepen connections with business. In the US, President Barack Obama called for politicians to make “strategic decisions about strategic industries”, and built public support for manufacturing in particular. Donald Trump has also talked about supporting the Rust Belt, although his “opportunity zones” are highly political, and much of his focus has been on taking down China rather than rebuilding the US. National growth strategies aren’t a bad thing — they can be positive for both individual nations and the global economy if they support those communities and industries hardest hit by globalisation. It is crucial that countries find ways to soften the backlash against laissez-faire capitalism if they want to protect liberal democracy. That will entail more co-operation between the state and the private sector in areas such as education and training; JPMorgan’s five-year, $350m education plan announced last week, which includes money to revamp vocational training at community colleges, is one example. Smart industrial policy is of value. Oligopoly isn’t. Witness the Boeing safety scandal, which has highlighted warnings from Federal Aviation Administration employees that the company had too much control over safety approvals. Likewise, the idea of Germany creating an even bigger “too big to fail” bank fills me with dread. Does no one remember that the German state-owned Landesbanks were some of the biggest contributors to the 2008 crisis? It is easier to capitulate to populism by supporting national champions than it is to craft and pass smart national growth strategies. This is particularly true in the US, where big companies in technology, finance and healthcare, among others, collectively spend billions on lobbying and political donations to push their own causes. That behaviour is one of the things driving a backlash against free market capitalism and globalisation that eventually hurts business. Public evidence that rich companies and individuals get preferential treatment in everything from college admissions to political access has fuelled much of the extremism that is polarising markets. Creating state-run giants won’t fix that problem. French and German officials may want to create their own Big Tech players. But their plans run counter to the efforts of the EU competition commissioner, who is doing much more to curb Silicon Valley and create an even playing field than any cross-border European conglomerate ever could. The US can keep Huawei out of American telecom networks, but unless the Trump administration can develop a coherent trade and development strategy at home, it will not really matter. A handful of tech giants are unlikely to create sustained growth on their own. A broad and diverse supply chain, including companies of all sizes, in high growth industries, could. That may require more state intervention and there’s nothing illiberal about that. It wasn’t China, but rather America’s first Treasury Secretary Alexander Hamilton who came up with the first formal industrial policy in 1791. But governments should be encouraging investment in human capital, revamping education, rebuilding infrastructure and fostering economic diversity — not making big companies bigger. National growth strategies are welcome. National champions are not. When people are more able to shape their own futures, they are less likely to be convinced that others are to blame for their plight. 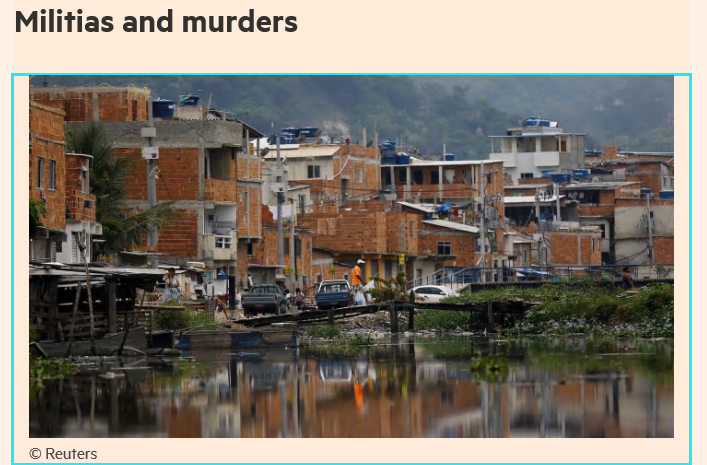 To the extent that it weakens support for virulent nationalism, devolution of global governance to national and local communities may make the world a little more prosperous – and a lot safer. CHICAGO – Britain is teetering toward Brexit. No one knows what will happen over the next few months. Yet around one-third of British voters support a “no-deal” departure from the European Union, which risks inflicting an economic disaster on the country. Many of these “no-deal” Brexit supporters are older and modestly educated, and live in economically depressed semi-urban communities and small towns, which tend to be concentrated in northern England. Although they are anxious about the steady deterioration in their economic prospects, studies suggest that trade or even immigration are not their only concerns. Brexiteers also resent their loss of control over policy, first to a distant national capital full of well-educated global elites, and in recent years to an even more remote EU. EU-mandated immigration rules are just the most obvious sign of their powerlessness. Brexit supporters voted to leave the EU in order to “take back control.” Unfortunately, Brexit, in whatever form it takes, may not give them what they want, fueling further resentment. Can anything be done to quell their anger? The disempowerment of communities is not a uniquely British phenomenon. 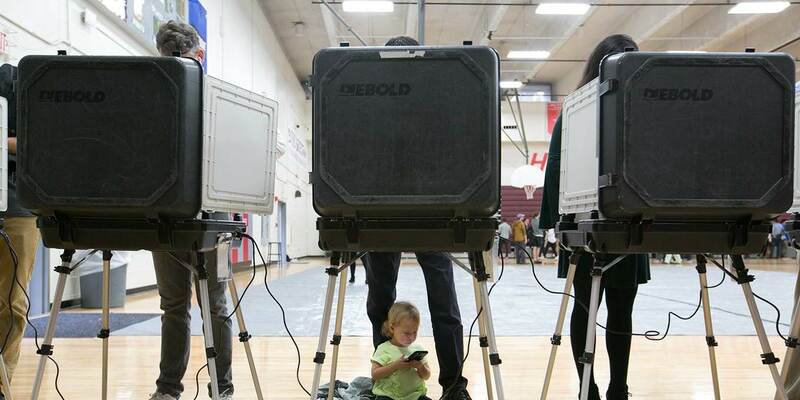 As markets expand across political borders, participants prefer a common governance structure that eliminates annoying regulatory differences and transaction costs. Historically, such integration happened within countries. As inter-regional trade and capital flows increased, demands for seamless regional borders and harmonized national regulation became louder. National governments therefore increased their powers and functions at the expense of regions and local communities. In turn, as globalization accelerated in recent decades, national governments acceded to international agreements and treaties that limited their sovereign powers. They have also ceded some powers to international bodies. For example, the European Commission’s harmonization of economic regulations across the EU limits the regulatory discretion of individual member states. This has catalyzed movements seeking to reclaim national sovereignty, like that of the Brexiteers. But even as power (and often funding) has moved from local to national and then international level, the effects of globalized markets and technological change have varied greatly. Strikingly, mega-cities have prospered while semi-rural communities have experienced diminishing economic activity and opportunity. The Great Recession that began in 2008 accentuated this trend, with cities bouncing back quickly while semi-rural areas languished. Such an uneven impact calls for responses that are suited to local needs and conditions. But formulating these responses is much harder when communities are disempowered. Disempowerment causes further collateral damage. When opportunity leaves economically marginal communities, despair and social dysfunction typically set in. The number of broken families increases, as do rates of substance abuse and crime. Those who can leave move away. Far from being a source of pride and social cohesion, the community becomes a repository of collective sorrow, if not shame. And its members look to alternative sources of identity and social solidarity, including nationalism. Populist nationalist leaders pledge to make their country “great again” by ridding it of the constraints imposed by international agreements and bodies. Of course, as they grab power back from the international arena, such leaders are tempted to resist the further devolution of power and funding to regions and communities. Instead, populist nationalists could turn more dangerously against the international system, presenting their supporters with a continuous parade of external villains to blame for their plight. This is a path that leads nowhere good. To be sure, there are numerous other types of nationalism; many Brexiteers want Britain to remain open to trade while severely restricting immigration, for example. But as growth slows and their populations age, developed countries will need both export markets and some immigration – the first to support demand, and the second to pay for the pensions and health care of aging populations. Balkanizing the world by erecting barriers is a sure way to convert unequal prosperity today into collective poverty tomorrow. The nationalists are right, however, that we have moved too far toward standardizing and harmonizing laws and regulations across countries. In this age of artificial intelligence, companies and traders can surely handle some national regulatory differences. Could we not bring some powers back to the country level, provided global markets remain open? Why must unelected technocrats decide the rules in closed rooms far away? The globalization of governance may be a step too far for globalization’s own good. But Brexiteers take note: the devolution of power will not stop at the national level – as suggested by the murmurs in Scotland and Wales. Declining local communities desperately need new economic activity, while their members have to become more adaptable to globalization and technological change. This often requires local engagement and solutions, aided where necessary by national governments. Political parties could play a constructive role in restoring powers, funding, and often health to many communities. Rebuilding a strong sense of positive community identity would likely make adversarial nationalism less appealing. At the very least, when people are more able to shape their own futures, they are less likely to be convinced that others are to blame for their plight. To the extent that it weakens support for virulent nationalism, devolution may make the world a little more prosperous – and a lot safer. Raghuram G. Rajan, Governor of the Reserve Bank of India from 2013 to 2016, is Professor of Finance at the University of Chicago Booth School of Business and the author, most recently, of The Third Pillar: How Markets and the State Leave the Community Behind.